CLEVELAND – Cleveland Metroparks and the Cleveland Foundation are holding the first annual Cleveland Metroparks and Cleveland Foundation Centennial Trail 5K on September 22, 2018. Participants are invited to enjoy the newest urban trails connecting Cleveland’s downtown area neighborhoods. 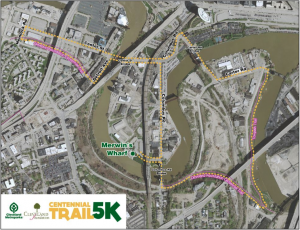 The 5K fun run & walk begins at the trailhead near the Columbus Street bridge along Cuyahoga River’s Irishtown Bend and connects to the Scranton Peninsula segment of the Cleveland Foundation Centennial Lake Link Trail. The 5K then cuts north along a portion of the Towpath Trail. Towards the finish line, the route travels along the newest half-mile section of the Cleveland Foundation Centennial Lake Link Trail from River Road to Detroit Avenue in the West Bank of the Flats. Along the route, enjoy some of the best scenic views of the skyline and Cuyahoga River that the city has to offer. Save when you sign up in advance! Adult registration is $20 online and $15 for participants 11 years old and under. On-site registration is $30 the day of the race and $20 for participants 11 and under. Children under 2 are free. One hundred percent of the proceeds from the Cleveland Metroparks & Cleveland Foundation Centennial Trail 5K registration will benefit the Emerald Necklace Endowment Fund of the Cleveland Foundation. The Emerald Necklace Endowment Fund generates annual income that helps Cleveland Metroparks conserve natural resources through land and wildlife stewardship, provide outdoor recreation for all ages, and facilitates recreation opportunities for all ages. Participants will all receive a Centennial Trail 5K event t-shirt and access to the Centennial Trail 5K after party at Merwin’s Wharf from 9 a.m. to noon. Enjoy live music, light snacks and refreshments along the Cuyahoga River. Additional menu discounts will be available. Event check-in will begin at 8 a.m. and the run & walk will kick-off at 8:30 a.m. In its inaugural year, the Centennial Trail 5K is not a competitive race; this fun run/walk will have timing available for personal tracking purposes. Register online today at clevelandmetroparks.com/5K.